The year 2014 marked 550 years since the proposal by King of Bohemia George of Poděbrady for a new arrangement of Europe based on a collective peace treaty. At the jubilee conference organized in Poděbrady, on 24 and 25 September 2014, new questions were broached concerning the political context, legal bases, and ideological sources of this inspiring project. 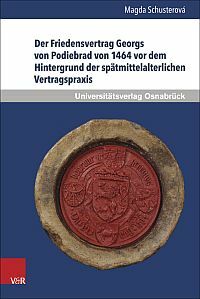 The book of Magda Schusterová complements papers presented here and enriches them, especially on the level that is set as the main aim of the work, which is the analysis of the project on the background of the wide array of late medieval contractual means. The work reflects the ever present connection between peace and law in the Middle Ages and focuses on the conjunction of historical and legal facets of the topic. The author meanwhile does not deny her primarily legal specialization. After the introductory setting of the content, aims, and methods of the research, the author introduces in a detailed way the historiography of her topic from the discovery of the text to the present. She subsequently focuses on its historical placement, where she pays attention to the related contractual activities of King George. She then approaches the issue of the late medieval peace treaties, for which she introduces a typology based on the duality of contracts concluded during a state of peace and contracts concluded during war, further specified as alliance contracts, peace treaties ending a conflict (peace treaties in the narrower sense), arbitration agreements, and contracts on ceasefires. The core of the work is the analysis of the Poděbrady's text, which is structured on a part aimed at the preamble, the part dealing with the proposed unity of the Christian sovereigns, and the part devoted to the anti-Turkish league. The Latin text of the contract adapted from an older edition is attached to the text. 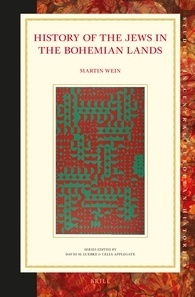 The book based on the author's dissertation has set itself very ambitious aims requiring not only a double specialization (history and law) but also a broad view on the European scale, as well as the ability to orient precisely in the Bohemian situation. The qualities of the book are best attested to by the areas in which the author presents her innovative approaches based on the broadening of the research framework. The context of peace treaties with the neighbouring monarchs is provided in great detail, where their impact on the internal peace and order has been usually more or less neglected. Surprisingly, they seem not much different from the aims usually followed by the landfrieds. The author also proves the influence of several normative texts in the conception of Poděbrady's peace project and analyzises the key terms in detail. From the position of a historian, however, I can also see a certain weakness. 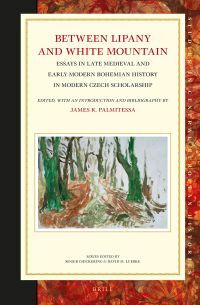 Although the author builds essentially a reliable factographic structure, it refers in some places to irrelevant sources, elsewhere the references seem somewhat random; reference to the latest literature devoted to the Poděbrady epoch would definitely benefit its historical part. Also the comparison of the text could have been anchored with a resolution of the possibly authorship and the range of immediate sources inspiring the text. For example, the author's innovative discovery of the similarity with the arenga of the landfried of King Frederick III from 1443 (128) is not examined further. 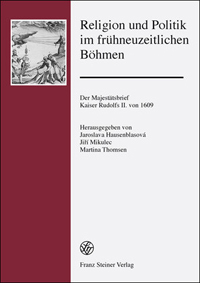 The hypothesis of the influence of the royal chancellor Prokop of Rabštejn (who originally served in the chancellery of Frederick III) offers itself and could thus help to explain the drafting of the project. 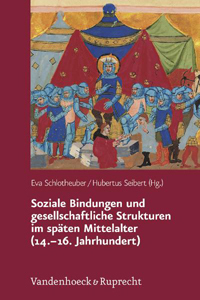 Nevertheless, the Schusterová's book represents an innovative and inspiring work, not only in terms of Poděbrady's peace project but also on the level of the broadly conceived comparison of late medieval peace treaties, unities, and leagues. The book therefore should not escape the attention of legal historians and historian-medievalists.